W.C. Steinmann says his family roots in southeast Texas date back to 1882. The 74-year-old rancher lives in DeWitt County, between San Antonio and Victoria, an area surrounded by oil and natural gas fields. Steinmann and other local property owners say the oil and gas boom is destroying the rural road system. This is not a new problem for Texas, where oil and gas drilling has been a pillar of the economy for generations. And DeWitt County isn’t the only affected area. During the 2013 drilling boom, county officials along the U.S.-Mexico border raised concerns about residents having to navigate yawning potholes, cracked asphalt and splintering shoulders. Texas leads the nation in both oil and natural gas production. In the 2017 budget year, the oil production tax brought the state more than $2 billion in revenue, while the natural gas production tax brought in a little less than $1 billion. But none of that tax money goes to fixing roads in the areas where the production is occurring. Instead it’s divided among several state funds: the Rainy Day Fund, the State Highway Fund and the Foundation School Program. The House Transportation Committee will hold a hearing on April 17 to “evaluate the impact energy exploration and production has on state and county roads, and make recommendations on how to improve road quality in areas impacted by these activities.” The House Energy Resources Committee will meet the following day to examine “investments in public infrastructure” in the Permian Basin, the state’s most productive oil and gas region. After both committees meet, they’ll publish an interim report. 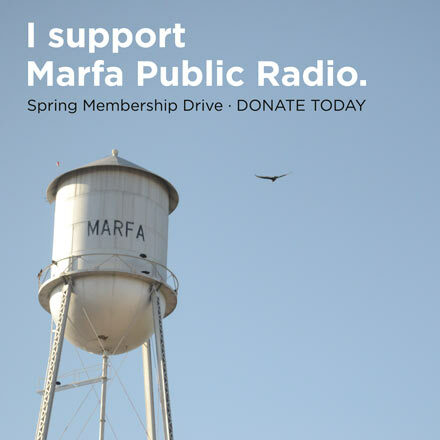 But until there’s a permanent legislative fix, some rural leaders say the state is enjoying a free lunch at the expense of local property tax owners who have to pay for the damage to their roads — often through higher property taxes. 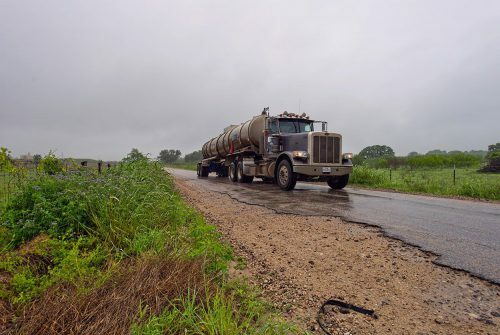 The Texas Department of Transportation has also struggled to maintain farm-to-market roads near oil and natural gas wells because of damage from heavy trucks. 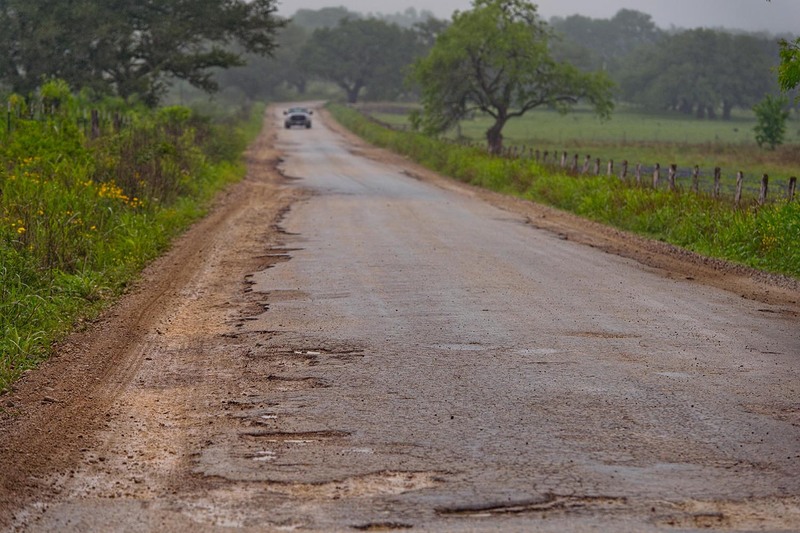 In 2014, Texas lawmakers approved a one-time appropriation of roughly $225 million to help counties fix damaged local roads. Of the state’s 254 counties, 191 applied, and identified more than $1 billion in needed road improvements. The biggest grants went to counties in West and South Texas with the heaviest oil and gas production. In the heart of the Permian Basin, Midland County Commissioner Robin Donnelly said the county received $5.9 million from the state in 2014 and put it toward a single road project that’s still not complete. That money didn’t go far in DeWitt County either, Fowler said. The county received less than $5 million in 2014, which paid most of the $6.2 million cost of repairing four county roads. The county’s road and bridge budget that year topped $31 million, he said. 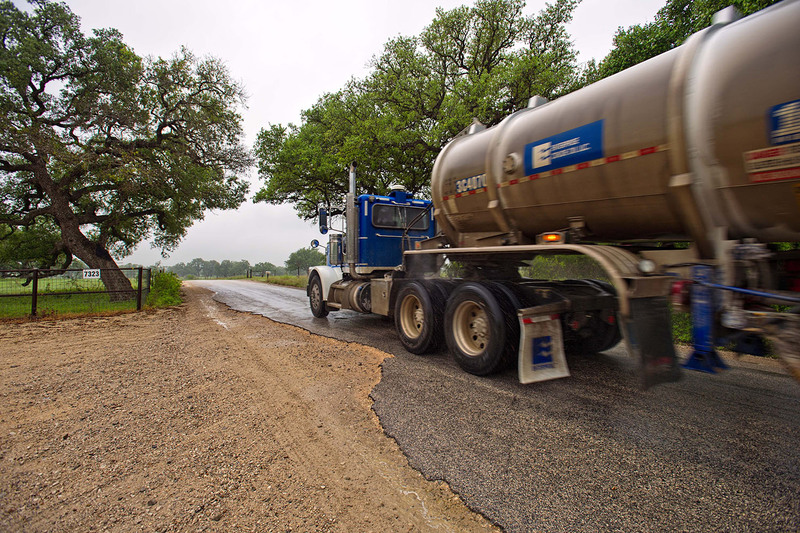 East of Midland in Howard County, County Judge Kathryn Wiseman said that during the last oil boom from 2011 through 2013 — when the oil price per barrel topped $100 — county roads suffered roughly $30 million worth of damage directly attributable to oilfield traffic. The county received $3.8 million from the state, she said. Many county officials are asking legislators to find a more permanent fix. Fowler said he supported a measure filed during last year’s legislative session by state Rep. James White, R-Hillister, that would have taken 2 percent of the money collected from the state’s oil and natural gas production taxes and given it back to the counties whose roads and bridges have been damaged. White said the bill died during the infamous “Mother’s Day Massacre,” when tensions between members of the Texas Freedom Caucus and their Republican leadership boiled over and the caucus members — angry over what they called “personal petty politics” — used a procedural maneuver to kill more than 100 bills. White said he plans to refile his measure during the 86th legislative session, which begins in January. State Rep. Travis Clardy, R-Nacogdoches, who sits on the House Energy Resources Committee, said he’s hopeful that with the state’s booming economy, there will be leftover money the state can send to rural counties affected by the oil boom. But Texas Comptroller Glenn Hegar recently warned lawmakers that they’d only have a $94 million beginning budget when they reconvene in 2019, compared to the $880 million beginning budget they had in 2017. But Clardy’s still optimistic they can find money to help fix local roads. This entry was posted in KRTS News and tagged oil, Permian Basin, roads, texas. Bookmark the permalink.